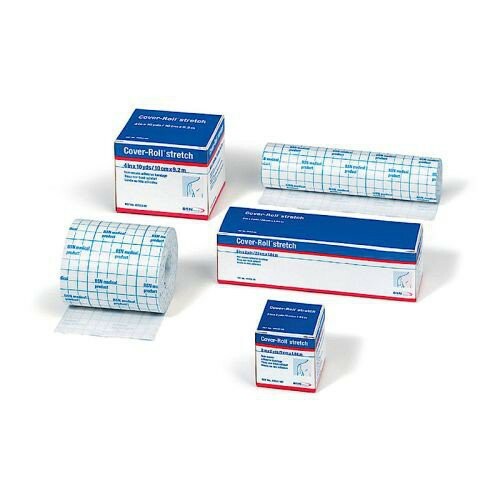 The Cover-Roll® Stretch Fixation Dressing 45554 by BSN Medical is a 6 inch wide non-woven dressing for larger wound and surgical sites. 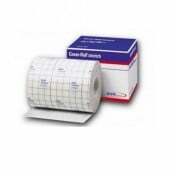 The 10-yard roll is long lasting which is ideal for surgical facilities. 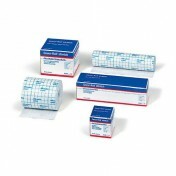 Cover-Roll® Stretch is specifically created to hold a primary wound dressing in place, especially when located in bendable regions. The stretch construction allows the dressing to conform to the body and allow for comfortable movement. Cover-Roll® Stretch has easy-to-cut gridlines on its paper backing to cut only the amount of dressing needed. This feature reduces waste and creates a template with the next dressing change. It's easy to apply after removing backing to expose the polyacrylate adhesive. It adds firm adhesion and creates light compression. The dressing's permeable layer supports faster wound healing by releasing moisture vapor to help maintain a moist wound healing environment. The Cover-Roll® Stretch is available in a variety of sizes found in the Cover-Roll® Stretch family. The rolls can be purchased by the single or case of 12 rolls to stock a hospital or clinic.